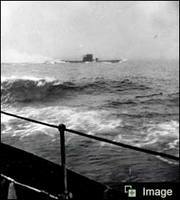 1 Caption: German U-boat U-210 from HMCS Assiniboine during attack that led to its sinking 6 August 1942. 2 War was coming. Germany wanted to win. The Germans took over many countries. Soon Britain would stand alone. She would need help. 3 The Canadians had just come through a hard time. They did not want to fight a war. Britain was a friend. She needed Canada's help. Canada's people were ready to help a friend. 4 Canada's army was small. It would have to grow fast. The navy needed men and ships. The air force needed planes and men. 5 The war ended a sad time. It was a time when there were few jobs and little money. A war meant many jobs. 6 Some jobs were for soldiers. Other jobs were to make things for the war. 7 Some of the things were new ships, tanks, planes, and cars. Uniforms, boots, coats, and helmets were needed. Food was needed to feed people. 8 Metals were used to make ships, planes, and other things. Canada had a lot of metal. Canadians were glad to work. 9 Canada declared war on Germany on September 10, 1939. France fell to Germany in June 1940. The Germans wanted to have Britain, too.